Fresh from scoring his 50th international goal and in the process breaking England's all-time goalscoring record, BBC One will tell the story of the real Wayne Rooney. With unprecedented access to his home and family, plus figures from world football, Wayne Rooney has allowed the cameras to go behind the scenes with him to deliver a personal portrait of the man behind the footballer. The one-off 60 minute film, 'Rooney – The Man Behind the Goals' will be shown on BBC One at 9pm on Monday 5th October. It is made by Goalhanger Films and commissioned by Charlotte Moore, Controller of BBC One and Acting Controller of Factual Commissioning and Events, Alison Kirkham. Wayne Rooney, says: "I have been approached many times about allowing the cameras into our lives and always said no. But now seems the right time. This film is not just about my goals, it's about the people I care about the most, my team mates, the people closest to me but most importantly, my family." He is one of the most recognisable faces in world football and as the captain of both Manchester United and England, Wayne Rooney is an iconic sports figure. After breaking the all-time England goalscoring record he has surpassed both Gary Lineker and Sir Bobby Charlton, meaning his name will go down in footballing folklore. This exclusive BBC One film promises to show the public Wayne Rooney off the pitch as it follows his journey from humble beginnings to bona fide world-class footballer and record-breaker as he discusses, amongst other things, his thoughts on his future, his music loves and his relationship with Coleen. 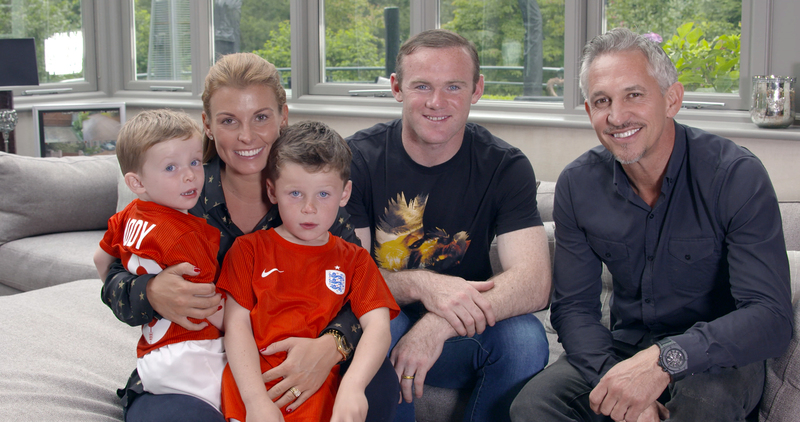 With Gary Lineker as the guide, the film shows Rooney at home with his wife, Coleen, and his two young sons plus features interviews with his parents. With access to Rooney at Old Trafford and at the England camp, he discusses his rise to the top, how those closest to him have influenced his career and returns to the housing estates in Croxteth, Liverpool, where he grew-up as an Everton fan to reflect on where it all began for him. The film features a stellar cast list of his former and current managers, plus some of the biggest names from football both in England and abroad. The cast of interviewees include Sven Goran Eriksson, David Beckham, Zlatan Ibrahimovich, Steven Gerrard, Frank Lampard, Ryan Giggs, Gary Neville, Louis van Gaal, Jamie Carragher, Roy Hodgson, David Moyes and the previous record holder, Sir Bobby Charlton.